Return to ShopBack and clickthrough to Fave every time you are making a new transaction. Fave coupon code: Enjoy 30% off for new users capped at $10 with code GIFT30. Subject to exclusions. Fave promo code: Get up to 30% off for new users with code NEW2FAVE. Top 50 Spa & Massage up to 95% off! Click through to view Faves vouchers. Visit Fave Singapore's website for more terms & conditions. Affordable car wash promos and other car care services with Fave! It doesn't take much to provide good care of your car with various car services promos and deals from car washing, coating to general servicing - just shop with Fave! Do check ShopBack for the latest available Fave promo codes and also to enjoy Cashback for extra savings! Enjoy lobsters, crabs and all the yummy things the sea has to offer with Fave! Indulge in the finest bounties of the ocean from ala carte deals to crabs and lobster buffets from places such as Hotel Jen Tanglin, Seattle Pike Chowder, Jumbo Seafood, Dancing Crab and many more with Fave! Make it an even more affordable affair with Cashback and Fave promo codes with ShopBack! Live it up with Yacht rental deals at Fave! Enjoy the high life at a fraction of the cost - get your hands on a Fave promo code at ShopBack to enjoy maximum savings on top Cashback! Rest your tired feet with reflexology treatments made affordable with Fave! Affordable foot reflexology treatments made even more affordable when you look for Fave promo codes and enjoy Cashback on top of that with ShopBack! Get your body moving with Fave! Keep fit on a lean budget with Fave Coupons on deals such as bicycle rentals, indoor archery, rock climbing, futsal pitch rental and many more! Use ShopBack for extra savings with Cashback! The road to a better you starts with Fave! There's plenty to learn and save when you use Fave promo code and ShopBack on things ranging from pottery workshops, guitar and ukulele classes, boating license courses, baking classes, Microsoft Excel training to bouquet arrangement workshops and many more! Enrichment and fitness classes coupons now on Fave! Bringing to you the best deals for fitness classes of varying categories to maximize your savings when you shop online! Shop with ShopBack for a chance at upsized Cashback on top of a Fave promo code for the greatest savings you'll ever have! Merchant's terms & conditions do apply. Coupons with up to 90% discount off full priced home services! Aircon services, photoshoots and thousands of other services to choose from, at a dime! Quote a Fave promo code for even cheaper deals! Merchant's terms & conditions do apply. Up to 57% off art classes! Get more discounts when you look for a Fave discount code at ShopBack! Let your inner Picasso out with Fave! Fave coupons: Relaxation spa and massage packages made affordable with these Fave vouchers! Fun activities and things-to-do at discounted prices with Fave sales! Get fit with the latest gym Fave promotions! Need help gifting? Select from over 50 gift ideas on Fave sales today! Different Fave promotion for each day of the week! A vast range of services and food discounts all at your fingertips with Fave promotions. Visit merchant’s website for more terms & conditions. Check out what’s flying off the shelves at Fave sales today! Best sellers updated daily, ranging from sweet vacation deals to best pig out spots, guaranteed the best deals with these Fave coupons! Merchant’s terms & conditions do apply. Cashback plus up to 85% off TCM massages at Fave! Visit ShopBack for the latest discount code! Nothing better than massage after a hard day's work! Fave deals: Shop from a variety of products and services priced below S$8 and up to S$10 off already discounted deals! Fave Singapore (previously known as Groupon) brings you the best deals and promotions. With instant savings from the running list of Faves promotions, shopping is now seamless and affordable! Over 50 different Fave coupons to choose from to perfect your mane. Check out merchant’s website for more terms & conditions. Top Popular Discount Deals! Deals with over 1,000 vouchers sold! Refer to merchant's website for T&Cs. Hit the high seas in style with deals for luxury cruises! There are many other great deals and Fave promo codes for you to enjoy savings on pretty much anything plus Cashback at ShopBack! Save up to 50% or MORE on your gastronomic journey; from buffets to restaurant eat-outs! A list of fave coupons at your disposable for maximum savings. Never pay the full price again when you purchase through Fave! From restaurant eats to simply take-outs, from, from burgers, Dimsum to pizzas, from Mufiz Restaurants, Ah Yat Seafood Restaurant to The Armoury - everything's on a discount! Merchant's terms & conditions do apply. Enjoy up to 81% off on cakes and desserts! Plus more savings if you look out for a Fave promo code at ShopBack! Satisfy that sweet tooth of yours! Selected Haircut and Treatments up to 76% off with Fave promo code! Love your hair or give yourself a new hair look! Check merchant's website for mo terms and conditions. Martial Arts Classes: Up to 92% off! More savings when you use a valid Fave voucher code! Fitness and self-defense all in one! Foot reflexology: Up to 92% off - save more when you visit ShopBack to look for updates on the latest Fave coupon! Get some much needed relief for your weary feet! Enjoy Cashback using ShopBack! Selected destinations in Malaysia at up to 66% off with Fave! Make your bookings with Fave now and enjoy!... Check out merchant’s website for more terms & conditions. Fave: Up to 50% off hair removal treatments. Find a promo code at ShopBack to save more! Look neat and groomed with Fave! Earn Cashback + Up to 46% off Have Fun KTV bookings on promo at Fave! Sing your heart out with Fave. Terms & conditions apply. Save at Fave on Laser Tag. Get the latest voucher code at Shopback to save more with Cashback! Have a great time shooting em' up with Fave! Personalized canvas prints at up to 81% from Fave plus Cashback! Look for a promo code at ShopBack for more! DIY workshops with up to 51% discount at Fave! Visit merchant's website for terms & conditions! Enjoy selected facial deals at Fave with up 91% discount! 86% off eyelash extensions with Fave promo! Hair removal services with up to 96% off at Fave plus Cashback! Check back for daily new Fave coupons! Be the first to see what people are purchasing! Choose from an array encompassing literally all the categories you could think of from dining, massage, services, travel and many more! Save more with Fave with Cashback from ShopBack today! Merchant's terms & conditions do apply. 25 Cheap Fave by Groupon Deals Singaporeans Are Buying This Week! 20 Delicious Deals You'll Find On Fave by Groupon Today! Fave is a free app that brings you discounted offers on awesome things to eat, do, see and experience in Singapore. Enjoy low prices every day with Fave and save up to 70% at top restaurants, cafes, spas, salons, gyms and more. You can browse for hundreds of Fave promos in your city and discover potential new favourite places go, restaurants to eat at or entertainment options. Fave will allow you to explore, purchase and redeem seamlessly in just a few taps, making deciding on what to eat and do simple and hassle free. Great offers everyday from Fave with ShopBack! Ever wanted to try a restaurant, café or spa but found it too expensive to justify? Or, you simply want to try going to somewhere new but, with so many options, you have no idea where to go and find paying full price for a new restaurant or spa just too much of a risk. Think about how much you spend on dining out, gym memberships, spas, beauty treatments and more. It’s quite likely to be a substantial amount. ShopBacks merchant page of Fave has pages upon pages of fresh deals daily that will help bring that number down a lot. With Fave, there will be great offers every day that will allow you to experience and explore new places, find new things to do without and new places to hang out at for a discount so it minimizes your risk and you get to venture out of your comfort zone on a dime. When you log into ShopBack and check out the Fave merchant page, you will find a plethora of options to choose from. Looking for a deal on a vacation? check out the travel option. Need some pampering? services will get you exactly what you need. Hungry for something new? Check out the eat section for large selection of top restaurants and eateries to sink your teeth into. Looking to get fit and actually fulfill that new year's resolution? activities has you covered with gyms, sports and fighting schools to get you back into fighting shape. With new restaurants and eateries being added every day, you will have a constant bevy of new options to indulge your desire for gastronomic adventure and to top it off, you can even choose how you save money. Discounts, cash vouchers, dinner and time-slot offers, 1 for 1 offers and even more are available for you. Life can be stressful, aside from easily planning for an evening out with your friends after work or even for the weekend, why not plan for a getaway to recharge and cool off or even a staycation? Fave often has great deals on hotels on our travel section and, you should check it out for sure to find out if you can turn a mundane weekend into quick getaway and escape the heat, literally and figuratively. There is nothing like a great massage to soothe sore muscles from sitting for too long or to remedy aches from being on your feet all day. Working constantly takes its toll and with special offers from top spas, salons, beauty centres and more, you can enjoy a relaxing spa, a wonderful massage to feel loose and light as a feather afterward or, emerging from a salon or beauty centre feeling and looking great. Singapore has so much great food. If you’ve been using Fave to find great new places to eat at and are worried about an expanding waist line or if you are simply, health conscious and looking to get in better shape, Fave has fantastic deals at great gyms or fitness activities. Browse for deals on weight training, Muay Thai, pilates, dance, yoga, Zumba, CrossFit, MMA and so much more so that no matter how you choose to keep fit, there will be something for you to try or even commit to. ShopBack offers cashback for all Fave deals, giving you more for less! Be sure to utilize the Fave page on ShopBack. There are a plethora of great deals you can find such as a Fave code, a Fave promo and a fave discount code you can use to make your purchase AND get the ShopBack cashback on top of the promotion and discount. If you want to know how you can use a Fave promotion through ShopBack to increase your savings, here is a quick guide to get you going in under 2 minutes. 1) Login to ShopBack with your existing account OR sign-up for a free ShopBack account. 2) Navigate to the Fave merchant page. Select the Fave promotion or Fave coupon code that you desire. For physical redemption, select what you like and buy the fave voucher with ease of just a few clicks from the ShopBack page. When you are at the venue and ready to claim your purchase, please show your voucher using the app to the personnel at the venue for them to assist in the redemption process. Fave is presently available in three cities. Singapore, Kuala Lumpur and Indonesia. We are constantly working to add new partners within our current cities to ensure that our users have a flow of great deals from top notch merchants. Please note that Fave will work with the currency of the country you are located in when using the app. Purchases of any discounts and vouchers can be from a week in advance. Fave vouchers should be redeemed from up to seven days ahead so please be sure to visit our partner within a week. If you need more great Fave promotions, the best way to be kept in the know is to connect to Fave by their various social media accounts and platforms. Through these platforms, they reach out to customers, respond to feedback on their services, and of course, be notified instantly of any and all new Fave deals. Fave has a great Facebook page where they respond rapidly to comments, questions, and messages. Reviews, feedback and suggestions can also be found there. Has this ever happened to you: You go on a searching spree for deals while shopping only to find things way over your budget? Well, why would you want to pay additional money for something when it is available at a discount? Wouldn’t it be great if you could get all possible kinds of great deals in one location, rather than fishing out for deals all over the internet? Enter Fave. It is an under-one-roof marketplace that connects consumers with various service providers. Siince Fave is a platform for vendors to reach a much wider audience than than they normally would, vendors are able to provide consumers with the best deals they can possibly ask for. Fave, formerly known as Groupon, is an American marketplace that connectes local service providers with consumers on the internet. The company came into existence in the year 2008 in Chicago. Seeing the demand for such services, Groupon soon expanded to different parts of the United States. By the end of the year, 2015, the company has managed to set up operations in over 500 cities racking in more than 48 million active users. 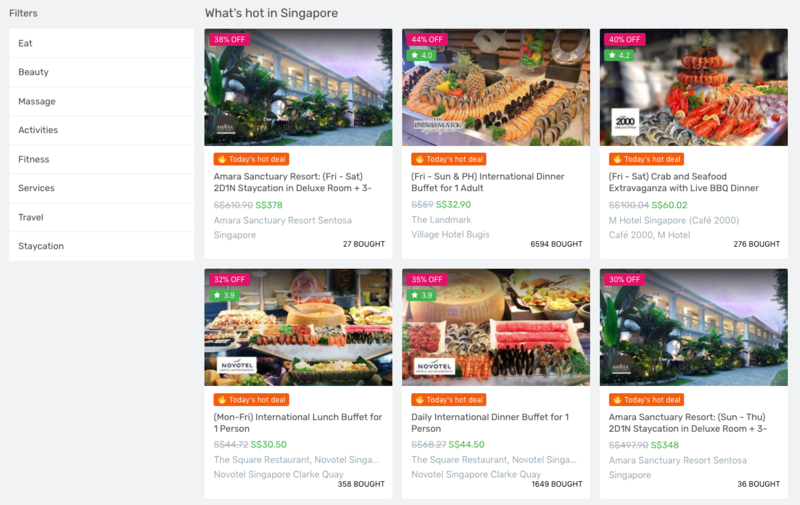 Groupon entered the Singapore market with the same intention of connecting local service providers with consumers. It was only in the March of 2017, that market leader Fave acquired Groupon. Fave came into the market as an online to offline market place and soon found a lot of takers in the entire Southeast Asian region. With its constant efforts and amazing offers, the company became the leader in the region and thus the acquisition was on the cards. You can either visit Fave’s website or Fave app for amazing deals in various segments such as good, services, travel, food, activities etc. As of now, Fave successfully connects more than 10000 local businesses with over 6 million consumers. If you are on the lookout for coupon codes for specific services, Fave is the right destination. The website provides a ton of services for you to choose from and benefits from some amazing deals. Here are some of the services that Fave lets you have access to. Are you someone who keeps having cravings for delicious food on a regular basis? If yes, checking out the Fave website will surely help you cut down on your dining expenses when you dine. You can get mouth watering deals on your favorite restaurants and cuisines via Fave. Whether you are looking for brand chains, buffets or fine dining, Fave has it all. The website also lets you choose deals based on price range, so that it is that much easier to zero down on a specific deal. For all the individuals who like to look their best at all times, there is a lot happening on the website for you. Fave offers some of the best deals in Singapore when it comes to beauty solutions or haircuts. You can look for special services such as nail treatments, facials, slimming solutions etc as well. Again, the deals are available in different price brackets, to ensure your search doesn’t take all that time. There can’t possibly be any better way to relax after some exhaustive work, than with a massage. The search for deals on spa treatments and massages ends at Fave. The website has a host of services on offer such as full body massage, treats for couples, spa, TCM and more. For those new to Singapore and want to explore the country without shelling out a lot of money, Fave can be of help to you. Whether you are looking for children’s playground, karaoke parlors or special indoor or outdoor events, you will be spoilt for choices. The number of people who take fitness seriously is constantly on the rise. For all your fitness related needs such as conditioning and strengthening, Pilates, Yoga, Martial Arts and so on, Fave has plenty of deals for you to choose from. For all you explorers and travelers, Fave is an ideal website for you to spend time in. The website offers regular package deals to some of the most sought after destinations. You will land up with some great hotel deals within Singapore as well. Apart from the above, Fave also helps you get along with life by providing services for day to day activities as well. For an instance, you can book various home care services on the website. It offers other services like automobile care, photography etc. Some of us enjoy spending time in hotels that provide an amazing experience while still maintaining its value for money. Fave has a section dedicated to such people, staycation. Under this section, the website has a list of some of the finest hotels and deals that you simply cannot ignore. How to Use Fave For Shopping? Getting discount codes for your desired services isn’t all that difficult with Fave. Even people who are new to the internet will enjoy the ease of accessing the website and its features. You just need to open up your browser and visit Fave’s website. There are two easy ways for getting the deals that you are looking for. In the case that you are not too sure of what you are looking for, you can browse through the categories to explore the website. You can select any of the categories mentioned above and the website will fetch the hottest deals for you. There are additional filters which cn help you zero down on specific deals as well. Alternatively, you can search for Fave deals using the search bar right on the top of the home page. Searching is also an engaging and intriguing way of exploring deals. As soon as you key in your search terms, the website will match any related deals available. So essentially, you might even get deals without having to type the entire search term. Fave discounts are one of the most affordable ways of exploring Singapore. Since you stand to save a substantial amount of money with the help of these deals, you can plan for even more activities. Following in the footsteps of Groupon, Fave has taken the goal of providing deals at affordable prices to the next level. When you visit the site, Fave discount codes are almost always available for you to save on your favourite services, restaurants or even activities. The website lists out all the deals with actual prices and price after the deals. This lets you get an understanding of the savings that you can avail should you proceed with the deals. What’s more is that you can pass on these benefits as gifts to people you love. If one of your good friends is in town, you can gift a voucher provided by Fave. They simply would have to login to the website and avail any deal they wish to. The moment they key in the voucher code, your gift will be passed on to them. Isn’t that a cool way of gifting your loved ones? This also saves you time that you would have otherwise spent on searching the right gift for them while not guaranteeing any results. When you land on the homepage of Fave, you will see a tab titled ‘What’s New’. This essentially provides you with the latest and most exciting deals available for Singapore; ranging from a stay in a resort on the outskirts of Singapore, a massage or spa to rejuvenate yourself to other miscellaneous services. You will find a Fave voucher for a variety of things which will help you save a lot of money. With the help of instant deals, users can stand to save as much as 70% on popular products such as gym, haircuts, food, holidays etc. On the homepage of Fave, you will come across a tab called Hot Deals. Under this category, the website lists the most sought after deals of the day. In fact, when you hover over a specific deal, you can see the number of people who have already opted for it. Aside from the most sought after deals for the day, Hot Deals also list out deals with a higher than average amount discount. These are almost always limited time offers and one needs to act fast to get their hands on these deals. If you are a regular on Fave or you regularly keep looking out for deals, this is a section that you should not skip at any costs. Look out for Fave Black Friday & Cyber Monday Sale at ShopBack! Looking to shop this year-end? Do it with ShopBack where you can find great offers from the best year-end shopping events. One of the biggest would definitely be Black Friday and Cyber Monday. So if you're looking for the best Fave Black Friday or Cyber Monday Deal, look nowhere else but ShopBack to keep you updated! Here, you can get a chance to save with a Cyber Monday promo code on top of Cashback for mega savings! If you are already happy with the deals and offers that Fave has for you, there are even more reasons to be joyous. A platform such as Shopback makes the online shopping experience even more worthwhile. Shopback also provides coupon codes from Fave for your easy retrieval. You can get a Fave promo code from shopback and use the same while availing a deal at Fave. Not that Fave already doesn’t have great deals, but would you miss out a change to make them even better? One might or might not have great deals all through the year and this includes other merchants such as Qoo10 and Sephora. But with the help of cashback Shopback, you can avail amazing deals throughout the year without having to worry much. ShopBack ensures that your shopping or living experience is not hampered due to unavailability of deals. If you are convinced with a deal, you can proceed with its purchase. The website would usually ask you to login using either standard Google credentials or Facebook or using even phone numbers. Before you checkout, you can key in any Fave coupon code that you have. The website will immediately show the benefits of using the coupon code. Once you have provided your contact information, you can proceed to the payment section. Fave supports various modes of payment such as credit cards/debit cards/online banking. Select a mode that you are comfortable with and continue with payment. As soon as Fave receives the payment, it would send out a confirmation email for the deal you just bought. You can then use this email to avail the service that had been looking for in the first place. There are a few instances where the payment might fail, but there is nothing to worry about. You can re-initiate the payment method or even edit the payment mode and finish up the payment. If you have opted for some deal and have partially consumed the same, refunds for the same will not be entertained by the company. The same holds good for unclaimed deals as well. Instances where a customer is billed wrongfully, the company holds the discretion of handling the case. There are no hard and fast rules for such cases. Most of the times Fave refunds the amount for such cases in the form of Fave credits. You can then reuse the credits to purchase something else on the website. Since these all differ based on case to case, there are provisions for refunds in cash. Cash refunds are usually subject to 10% surcharge of the total purchase amount. Fave also reserves the right to follow up the events with investigations to ensure fair treatment to the customers as well as vendors. To support its endeavour to becoming one of the best in the online to offline market, the customer support department of the company is crucial. Over the years, Fave has strengthened its position as a company that values customers’ views and suggestions. They have an exhaustive list of FAQs which should help you clarify any queries that you may have. If you are not happy with those results, you can opt to submit a request. The website provides a small form where you need to provide details of your query and the company would get back to you as soon as possible. You can also contact Fave via their Facebook channel here.